carly tee: a little christmas sparkle in july! We have been having fun thinking about the holidays at EH this week! 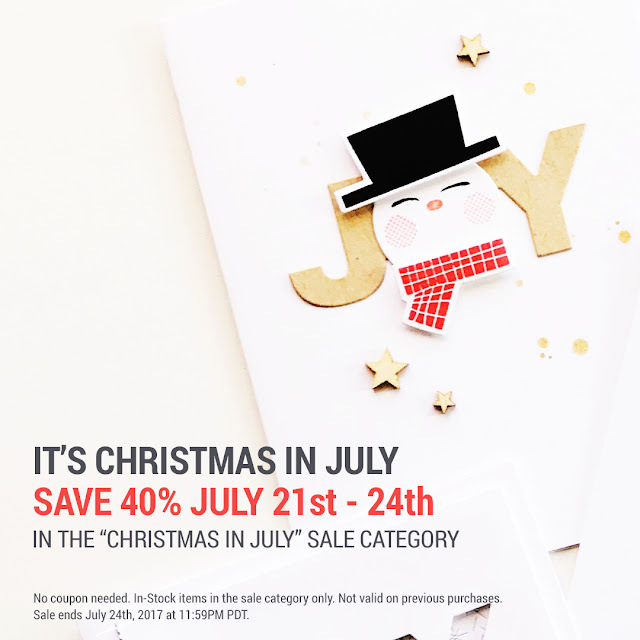 And today our whole EH design team is celebrating with Christmas in July cards! I love creating holiday cards but somehow I have a hard time getting them done to actually send at Christmas! Maybe starting in July is the answer, what do you think? This card was super simple to create! I started by stamping snowflakes, stars & part of the sentiment from the Essentials by Ellen Season to Sparkle set, in Versamark on white cardstock. I embossed them with clear powder (white would have worked too). Over the embossed images, I applied Indian Gold Nuvo Mousse. I love the rich metallic finish of the Nuvo Mousse. And when the mousse was dry (only about a minute), I used a very dry baby wipe to buff the excess mousse off of the embossed images. The pictures hardly do it justice so if you haven't used it yet, just know that it is a showstopper! The "sparkle" is a die cut word, layered and covered in Pink Flambe Nuvo Mousse. That's it, so easy! I planning to create a bunch to at least jumpstart my Christmas card stash, LOL! P.S. Ellen Hutson has a smokin' good sale on Christmas stuff! You can get the Season To Sparkle set (or something else cool) for 40%. Check out all the cool stuff here! Beautiful! I love the golden glow!